Every second is precious at a fire scene. The last thing any firefighter wants to have happen when arriving on site is to open a compartment and struggle to get a critical piece of equipment. Fortunately, the professionals at Golden State Fire Apparatus in Sacramento – the region’s exclusive dealer for Pierce Manufacturing – make it easy to customize and organize everything fire crews need to carry with them on their trucks. George Juelch is GSFA’s loose equipment technician. He’s the guy each customer will deal with from start to finish when deciding how to arrange, mount and safely stow their gear. Juelch brings decades of hands-on firefighting experience to his current job. He served for 33 years in the Lodi Fire Department, 14 of them as a battalion chief. He appreciates firefighters’ needs because he’s been there himself. Typically, the process starts with a “pre-construction” meeting between Juelch and officials from a department before they take possession of a new vehicle. 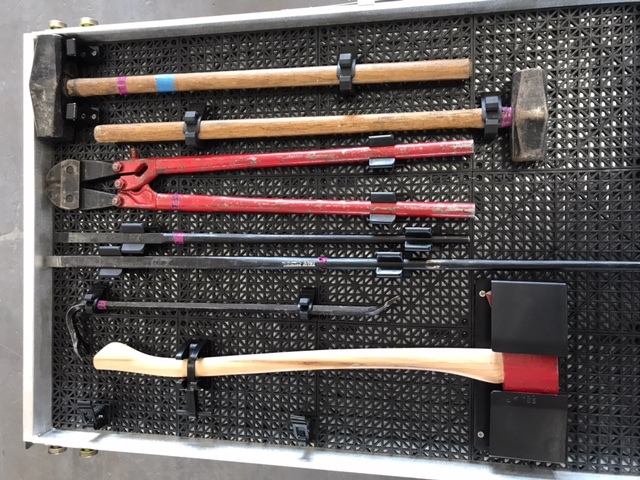 Juelch encourages customers to bring all the loose items they would like to have on the vehicle – axes, crowbars, extraction equipment, radios, flashlights. In addition to mounting equipment, Golden State also can add USB ports, 12-volt power outlets and charging stations in the cab or other parts of a vehicle for thermal imaging cameras, radios and flashlights. The consultations can last a couple of hours to as much as a full day. Juelch will show photos of how he has arranged equipment on other vehicles, but each interaction is different because every agency has its own specific needs. He listens, takes notes and imagines the people relying upon his solutions. There is no one-size-fits-all approach to organizing equipment. Battalion Chief Dave Ennes of the San Jose Fire Department said the consultation with Juelch was invaluable. After the meeting, Juelch comes up with an estimate for how long work will take and how much it will cost. The time can vary from a week to up to three, depending on how many modifications are needed and whether Juelch needs to fabricate anything for the project. Some departments add only a handful of brackets or mounts; another had 37 specific things that needed to happen. No matter the scope, Juelch maintains close contact with the customer via phone or emails that sometimes include photos. A spokesman for the Visalia Fire Department complimented Golden State for its mounting of our various tools and equipment for its last Arrow XT 105HD Quint, including the Hurst Extrication equipment. As a former firefighter, Juelch tries to anticipate a crew’s needs. For instance, he recommends placing the heaviest equipment down low and at the front of pullout shelves for easier access. Tool boards include space for mounting on both sides. He likes to “back nut” fasteners and cover them with caps. He rounds off and buffs all bracket corners to eliminate sharp edges in order to reduce the chance of gloves or coats snagging anything or anyone cutting their hands. PAC, Kochek and Zico mounts for tools and equipment are stocked on site, but GSFA will customize anything within reason to meet a customer’s needs. Juelch also builds things to last, knowing the tough conditions firefighters and their equipment will face. It’s GSFA’s acute attention to the smallest of details involving space management and mounting that most impresses their customers. 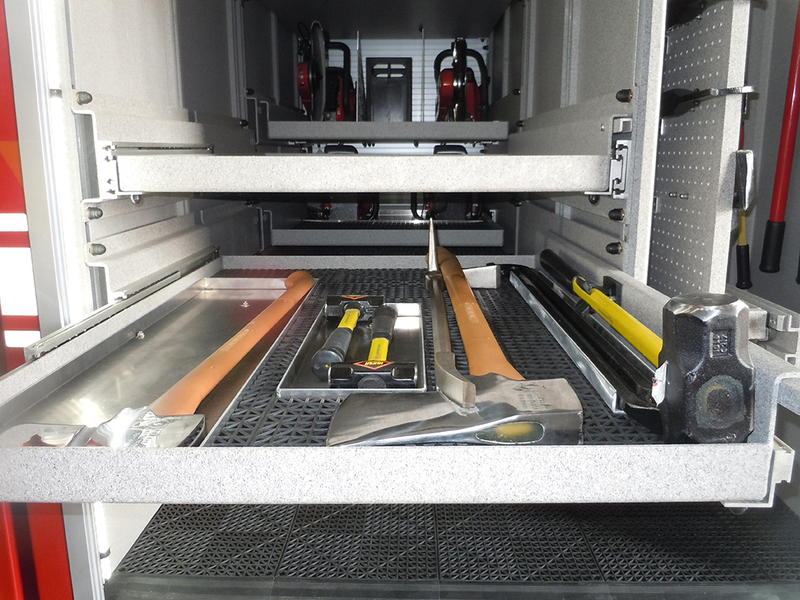 Are you efficiently maximizing all the space on your fire apparatus? Do you have questions about how to mount or place a new piece of equipment? Give the pros at Golden State a call at (916) 330-1638 or email them at info@goldenstatefire.com to see how they can help.